Tropical Wild Splash Water Slide has 2 lanes and a landing. **RENTAL PRICE INCLUDES LOCAL DELIVERY, SETUP (ON GRASS), TEARDOWN, AND PICKUP WITHIN 15 MILES FROM OUR STORE. ADDITIONAL DELIVERY AND PICKUP FEES APPLY FOR LOCATION OUTSIDE 15 MILES. **NOTE= EXTENSION CORD IS AVAILABLE TO RENT (NOT PROVIDED). UNIT MUST BE SET UP WITHIN 50' OF OUTDOOR GROUNDED OUTLET, ON LEVEL GROUND, AND STAKED INTO GRASS. 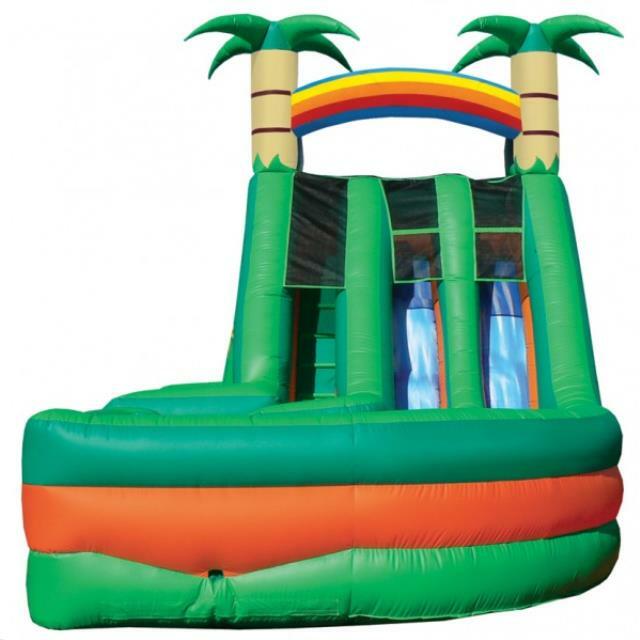 * Please call us for any questions on our tropical wild splash waterslide rentals in Rocky Mount and Wilson NC.